A drug-user has been fined after he was caught with cannabis which he claims to smoke for pain relief after he was injured in a bicycle crash. 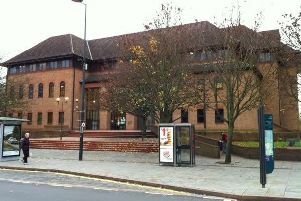 Chesterfield magistrates’ court heard on October 10 how Carl Russo, 28, of Ireland Street, Staveley, was caught with the cannabis after he had thrown it out of a car which had been stopped by police. Prosecuting solicitor Angela Hadfield said the vehicle was stopped and the defendant was a passenger in the vehicle and he accepted throwing a blue bag out of the vehicle with the cannabis inside. Russo pleaded guilty to possessing the class B controlled drug after the incident in Staveley on November 15, 2017. Defence solicitor Kevin Tomlinson said the cannabis recovered had a street value of £30 and Russo accepted it was his and he had bought it earlier that day for personal use. Mr Tomlinson added that Russo, who works for artificial grass company Nomow, based in Buxton, uses cannabis because he suffers with pain after he was injured during a pedal cycle accident. Magistrates fined Russo £100 fine and ordered him to pay £85 costs, a £30 victim surcharge.